The Flagship of the Sea Ray Sundancer Line Up Has Been and is the 540 Sundancer. This is the best 540 Dancer on the market. Cleaner than Clean and Loaded with all the "TOYS"
Cat Powered, Hydraulic Swim Platform, Bow Thruster, Air-Conditioned Helm Deck, the list goes on. Synthetic Teak cockpit and swim platform for the rich look of Teak without the up keep. See the full spec's for the full look. VIDEO...VIDEO... Watch the video for a better close up look. What Sea Ray Wants You To Know. 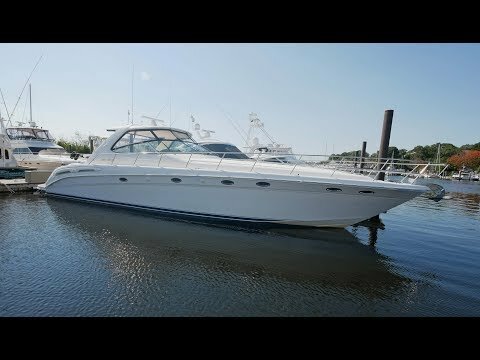 The Sea Ray 540 Sundancer, with its raised helm area design, gives the same amount of privacy and cabin space expected on an aft-cabin model, yet with all the open cockpit room of an express cruiser. The U-shaped seating area has an electrically actuated retractable sunpad. Even though the 540 Sundancer can be comfortably handled by two, you'll most likely want to share the wealth of standard features with family and friends, including a wet bar with cooler and icemaker, an aft cockpit sun shade, cable TV outlet and a Clarion AM-FM digital cassette stereo with six-disc CD changer subwoofer, amplifier, four speakers, and cockpit remote control. Even with so much of the cockpit dedicated to passenger space, there's also abundant room for personal gear in the port and starboard side compartments and docking equipment stows away neatly in the aft deck. The large private cabin of the 540 Sundancer is just as well-appointed as the cockpit with granite-colored countertops, dimmable lighting, and handcrafted wood trim in either vitricor cherry finishes. Custom curtains, deep-pile stain-resistant carpet and concealed floor storage accentuate the modern decor. The mid-ship master stateroom has a queen-size bed with innerspring mattress and a gas-assisted hatch that reveals carpeted storage underneath. There's also a standard entertainment center with a TV - VCR - radio combination and a Bose Acoustimass 3 speaker system with remote control. A full-size bed and additional storage space make the guest stateroom perfect company. Both the master and guest head areas offer a VacuFlush head, power vents, striking cultured marble flooring, and Corian countertops with Grohe designer faucets. In the salon, a curved Ultraleather HP sofa cleverly hides an electric slide-out bed. There's even a concealed privacy curtain that pulls out when needed. The hidden, but complete galley has a three-burner cooktop, refrigerator - freezer with icemaker microwave - convection oven and a convenience package featuring a Spacemaker coffeemaker. Salon entertainment center with a color TV - VCR with remote and a Bose Lifestyle 20 stereo system with Jewel Cube speakers and LS bass module. From a technical standpoint, this boat is a masterpiece with responsive twin Cat 660hp Diesels and every control needed for unquestionably smooth sailing including a BOW THRUSTER. Full Garmin electronics package including twin 12' MFD and Garmin Autopilot.
. The 540 Sundancer has a multiplexed digital LCC systems monitor for quick engine diagnostics and pump monitoring. The 540 Sundancer has a hydraulic lift swim platform, fiberglass hardtop. The constant care, upkeep and updating is what sets this 54 Sundancer apart from the rest. New canvas, new Racor filters, cockpit stereo and raw water pumps. Bottom soda blasted and barrier coated. Power Swim Platform makes dingy loading a breeze. Look no further... You have found it. Turn Key ready to go. Needs nothing. Call the listing broker now to arrange for a showing. Call or Text Capt. Ed at 203-676-7089 for more information and to arrange for a showing.